Posted on August 31, 2016 by Admin. This semester’s Conversation Partners Program is about to begin. Are you interested in joining? 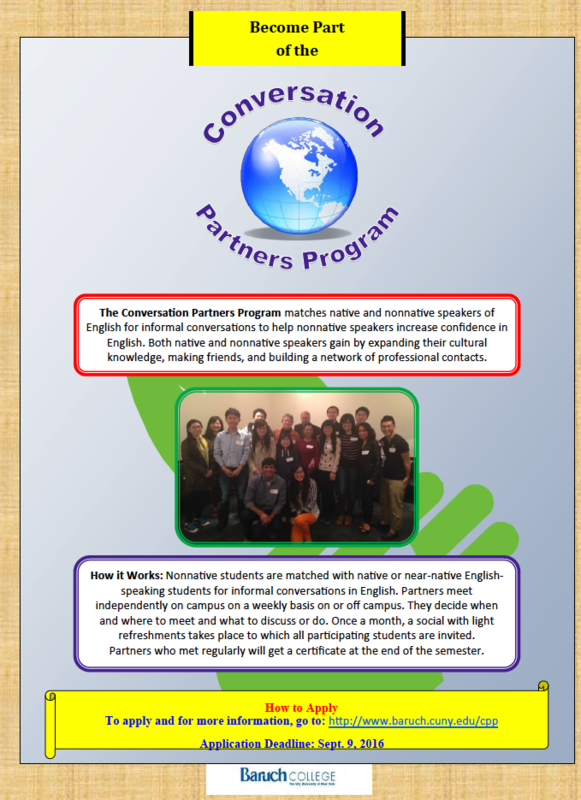 The Conversation Partners Program matches native and nonnative speakers of English for informal conversations. It is a great way for nonnative students to gain confidence in English, for native speakers to gain experience in communicating across language barriers, and for both native and nonnative speakers to expand their cultural knowledge, make friends, and build a network of professional contacts. To participate, you should be willing to commit to meeting your partner on a regular basis throughout the semester. If you have met at least seven times, you will receive a certificate at the end of the semester—a great way to enhance your resume. 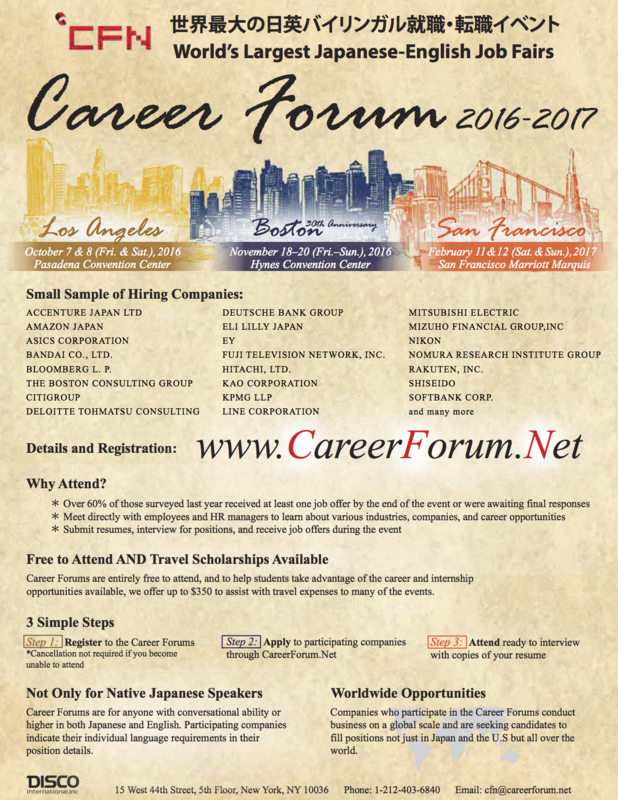 To sign up, please fill out the Application Form on the website. The deadline for signing up is FR, Sept. 9. The 158th meeting of the NY Comics & Picture-story Symposium will be held on Tuesday, Sept. 6, 2016 at 7pm at Parsons School of Design, The New School, 2 West 13th Street, in the Bark Room (off the lobby). Free and open to the public. In present Japan, gekiga loosely refers to a body of Japanese comics (manga) with a long narrative (story manga) that is oriented toward teen and older male readers, typically with little or no humor. In manga criticism, gekigahas been defined in contrast to mainstream manga in terms of visual style and content. Whereas postwar mainstream manga was formed around Osamu Tezuka’s (quasi-Disneyesque) cartoony style,gekigais frequently associated with more “realistic” drawing style with serious or darker themes. Though fully integrated into present Japanese manga culture, gekiga, from its nascent state, assumed a distinct characteristic of being (arguably) alternative to the mainstream manga. This talk explores the socio-historical and cultural context of the development of gekiga by examining the shifting media ecology of Japanese comics industry, important comics artists and their works, and the impact of gekiga on other artistic and cultural practices. The focus will be on two major “alternative” magazines: Garo (1964 – 2002) andCOM (1967-1972), both of which offered an outlet for innovative, unorthodox, and transgressive artists. Both comics magazines not only expanded comics expressions but also pushed the conceptual horizon of manga, attempting to legitimize the artistic value of comics while maintaining a sense of unruly proclivity by being “alternative.” Gekigarose in tandem with the counterculture of Japan in the 1960s when Japan witnessed the rise of student revolt, civic and intellectual participation in politics, and artistic experimentalism–all of which synchronically shared the global cultural and political climate of the time. This talk traces the emergence and development of gekiga in the context of postwar Japanese visual culture, mainly from mid-1950s to early 1970s, illustrating how both these comics magazines played a role in shaping the visual culture of Japanese counterculture. Shige (CJ) Suzuki is Assistant Professor of Modern Languages and Comparative Literature at Baruch College, The City University of New York (CUNY) where he teaches courses in Japan Studies such as Japanese literature, film, and popular culture. Professor Suzuki received his Ph.D. in Literature from University of California at Santa Cruz in 2008. His current research interests are comparative literature, cultural studies, critical theory, and comics/manga studies. He has published articles in both English and Japanese. Recent published articles include “Tatsumi Yoshihiro’s Gekiga and the Global Sixties: Aspiring for an Alternative” in Manga’s Cultural Crossroads, edited by Jaqueline Berndt and Bettina Kümmerling-Meibauer (2013), “Traversing Art and Manga: Ishiko Junzō’s Writings on Manga/Gekiga” on Comics Forum (2014), “Autism and Manga: Comics for Women, Disability, and Tobe Keiko’s With the Light” in International Perspectives on Shojo and Shojo Manga: The Influence of Girl Culture, edited by Masami Toku (2015). 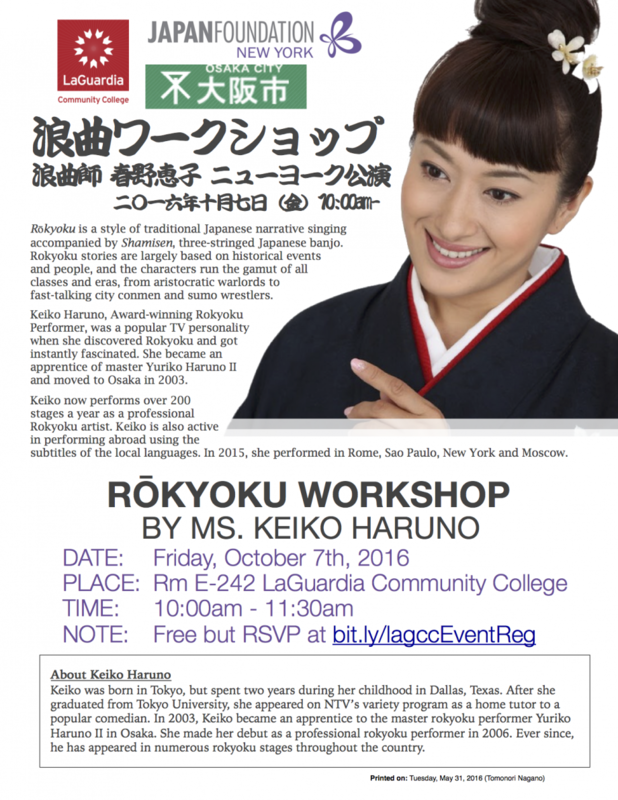 LaGuardia Community College is going to host a workshop & performance of Rokyoku (Japanese narrative singing) by Ms. Keiko Haruno on Friday, October 7th. This event is open to the public. Please see the attached flyer for more information. Students with some degree of both Japanese and English language abilities are invited to come speak and interview with hiring companies for full-time and internship positions at three Career Forums during this academic year. Happy Hour. 2015. Directed by Ryusuke Hamaguchi. The Museum of Modern Art will present Ryusuke Hamaguchi’s film Happy Hour, a “wise, precisely observed, compulsively watchable drama of friendship and midlife awakening,” through August 30th. Posted on August 21, 2016 by Admin. In June, the Japan Foundation Japanese Language Institute, Kansai launched the Listen Together: The Songs of Japan<http://nihon-no-uta.jp/index.html> website to plenty of positive feedback. Now you can teach your students songs of varying levels of difficulty, with videos! In July, they astounded us with the Japanese e-Learning platform “Minato<https://minato-jf.jp/>.” This website features a range of free online courses for beginners. Although most of them are self-study courses, there are also “tutor-supported courses” with live lessons from teachers. And now, in August, they have just launched the HIROGARU<https://hirogaru-nihongo.jp/> website for higher-level learners. This modern website features audio clips, videos, vocabulary lists, and quizzes surrounding 12 different topics about Japan, Japanese culture, and language. Please consider using all three of these amazing free websites in your classrooms! Feedback is always welcome! Posted on August 1, 2016 by Admin. JF Japanese e-Learning Minato is a Japanese language learning platform provided by the Japan Foundation. Minato means “port”. Here at Minato, a place to learn and meet other like-minded people, we invite you to expand your understanding and knowledge of Japan, Japanese people, and the Japanese language.